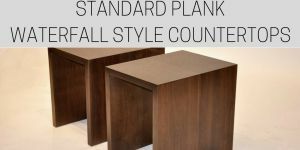 Brooks Custom's Standard Plank countertops are similar to the premium wide plank line in terms of durability and design options. The standard plank construction style offers more variation within the boards, allowing for some tight knots and sapwood, adding more warmth and charm. Standard plank tops are cheaper than wide plank tops, they offer a good budget choice. Standard plank boards are thinner than those chosen for wide plank tops. Boards generally measure three to five inches (3"-5") in width and are randomly selected. This selection contributes to the appearance of tight knots, light grain, and pith marks that add charm to the countertop. The countertops are sealed with a Waterlox finish. This is a water and stain resistant finish. Tops require routine maintenance; use Windex or any other non-abrasive household cleaner. May need to be refinished after time and use; this can be done by our skilled technicians. Because this finish is not permanent, we do not offer any stain for our standard planks; they are available in natural color only. Available in all of our standard edge profiles. Choose from any available wood species. Cutouts for sinks and cooktops are easy to incorporate. This photo gallery represents a sampling of the countertops we've made in this construction method. 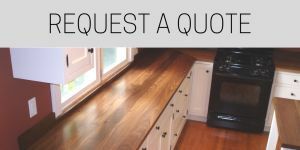 If you're interested in making a standard plank top for your next project, send photos or drawings to quotes@brookscustom.com and we will review your details and prepare an estimate for you within one to two business days. All of our wood countertops are fabricated and prepped for installation or delivery directly from our factory showroom in Mt. Kisco, NY. Our easy design process puts you in contact with our craftsmen and engineers to ensure that your vision comes to life.